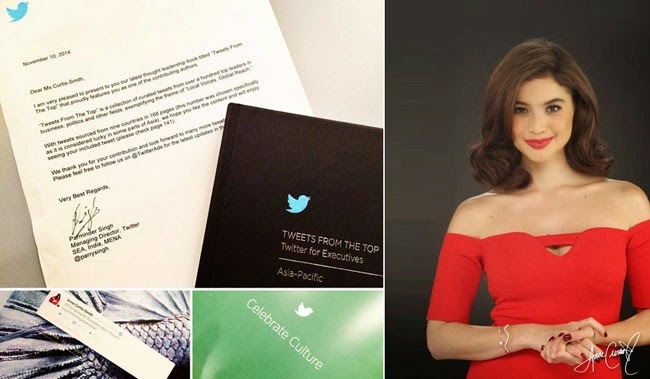 It’s Showtime host and Dyesebel star actress Anne Curtis is by far one of the most followed Filipina celebrity in Twitter and now she is happy to share that one of her tweets had been included in a book of tweet collections from various Asia-Pacific personalities. There are over a hundred personality tweets that had been chosen and Anne Curtis was excited to share to her followers the good news of being one of the features Twitter user. On December 17, the 29 year old actress-host shared that she is included in "Tweets from the Top” through a photo sent to her by the managing director of Twitter in Southeast Asia, Parminder Singh. This year’s Twitter Tweets from the Top book theme is ‘Local Voices, Global Reach’. Twitter wants to share how personalities and executives stay on top of their game, move the market, build thought leadership,celebrate culture and their people, and share their perspectives, through Twitter. The book had been divided into six sections namely: Share your Perspective, Stay On Top of Your Game, Move the Market, Build Thought Leadership, Celebrate Culture, and Celebrate Your People. Anne Curtis’ tweet had been included in the section of Celebrate Culture that concentrates on the celebration of unique cultural moment. The actress’ featured tweet had been posted last May 23, 2014. It was a tweet about her taping of the TV fantasy series Dyesebel whrein she played as the main protagonist, a mermaid turned human. Her tweet had been retweeted 231 times. Dyesebel is a recreation od an adaptation of Mars Ravelo’s comics about mermaid with various adventures towards true love. Meanwhile, Anne currently has more than 7.56 million followers making her the most followed person in Twitter.